With a focus on Mi’kmaq and Beothuk visual culture, Jordan Bennett’s practice utilizes painting, sculpture, video, installation, and sound to explore themes of land, language, the act of visiting, and familial ties. In doing so, Bennett challenges colonial perceptions of Indigenous histories, stereotypes, and presence. For this solo exhibition, titled Ketu' elmita'jik, Bennett has been invited to create a site-specific wall painting that responds to the architecture of the gallery space. 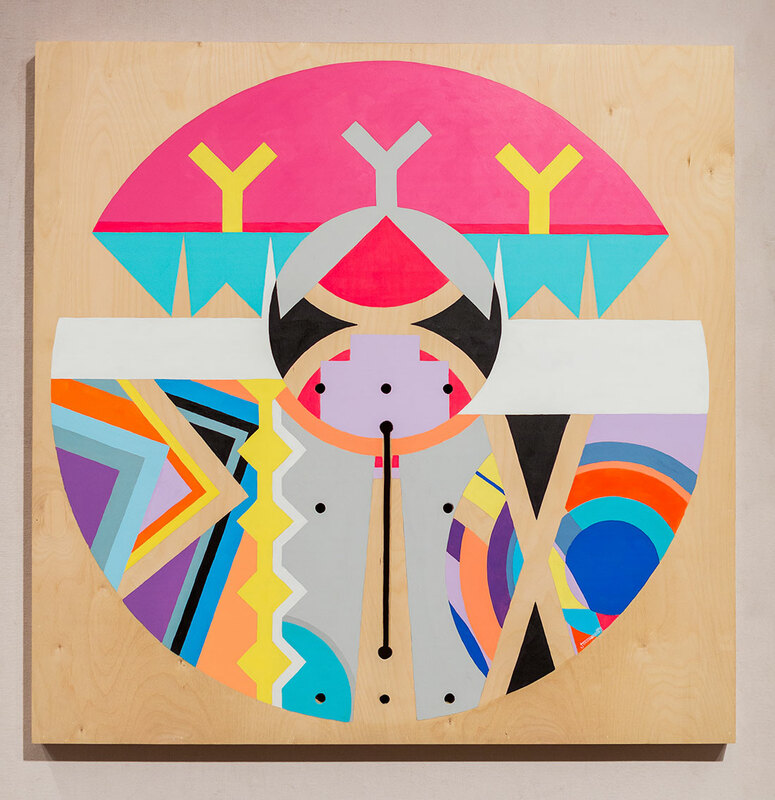 Drawing influence from historical and pop cultural references, Bennett’s new composition, together with examples of recent work, will result in an immersive environment that (re)considers the institutional mechanisms through which Indigenous peoples and practices are often framed. In arriving at this installation, the artist has researched Mi’kmaq objects from Nova Scotia’s Permanent Collection and other institutions, expanding upon their patterning and iconography within the mural format alongside which they are displayed. In this context, these ‘artifacts’ aren’t seen as static ‘things’ rather they are to be looked at as very active objects that are engaged in an ongoing conversation between the past and the present. Ketu' elmita'jik – meaning “they want to go home” in the Mi’kmaq language – is the artist’s first solo exhibition in Nova Scotia and will involve an artist residency at the Art Gallery of Nova Scotia. Ktaqmkuk (Newfoundland) artist Jordan Bennett has participated in over 75 solo and group exhibitions nationally and internationally. He has shown his work in venues such as the National Museum of the American Indian, New York; Museum of Contemporary Native Arts, Santa Fe; Winnipeg Art Gallery; The Power Plant, Toronto; Musée d'art contemporain de Montréal; and was one of two artists to represent Newfoundland and Labrador in the 2015 Venice Biennale at Galleria Ca’Rezzonico. In 2018, Bennett was shortlisted for the Sobey Art Award, Canada’s preeminent prize for contemporary art.